I’ve always used my Mom’s chili recipe. It’s Tex-Mex all the way. My allergy kid is off tomatoes right now however, so that recipe is out. Recently, I’ve been experimenting with alternatives and honestly, we haven’t like any of them….until this one. It’s a keeper. 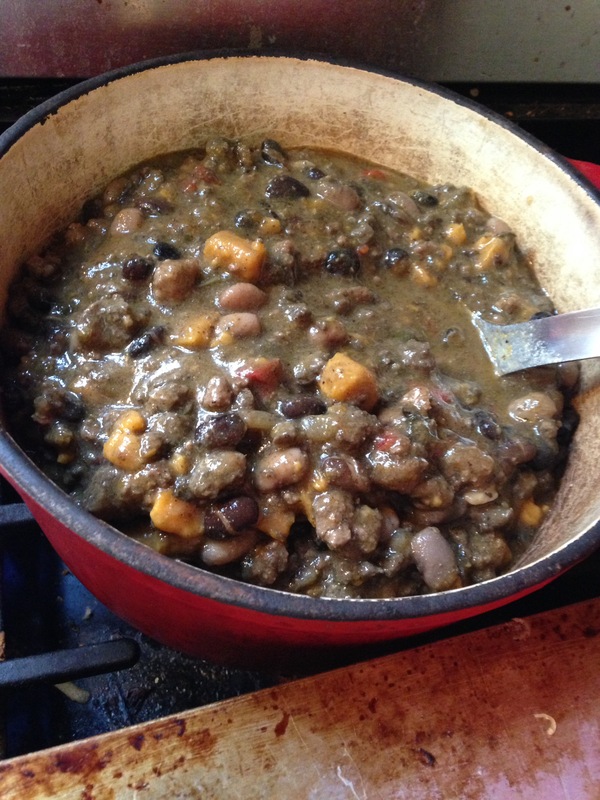 A Facebook friend posted this recipe for a black bean, sweet potato vegetarian chili. It sounded appealing because it used many of the same spices that I typically use in chili, so I tweaked it a bit and made it my own. The first change was to add meat. Sorry to my vegetarian friends. I added ground turkey, omitted the tomatoes and changed a few other ingredients based on what I had on hand and what sounded good. Brown the turkey meat adding the chopped items and then the spices. If needed, add enough water to cover all the ingredients. Simmer until heated through or until the beans are tender if using dried. This would also make a great crock pot meal if you cooked the meat ahead and tossed all the rest in the crock pot the day of. I like this recipe because it tastes similar to my standard chili and has a good enough base with the sauce, peppers and sweet potatoes that none of us missed the tomatoes. Eat well everyone!